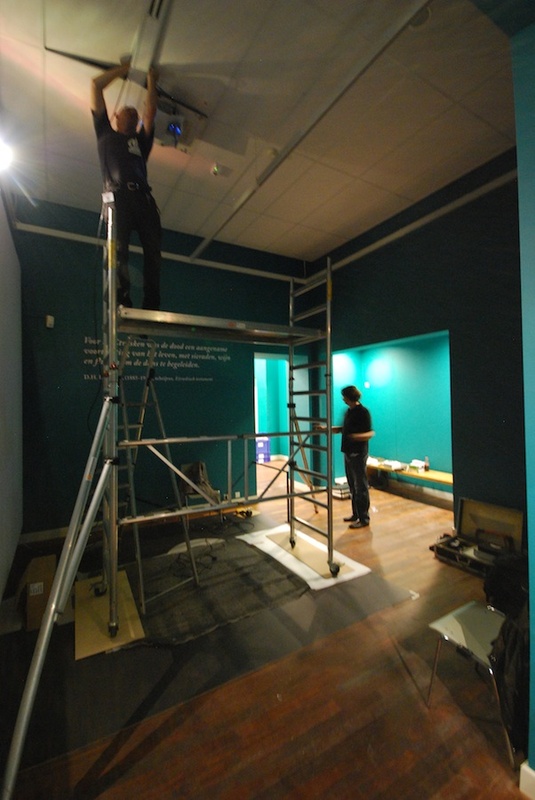 At the exhibitions in Amsterdam and Leiden, the last objects are put in the glass cases, the floor is cleaned and the spots are aligned. 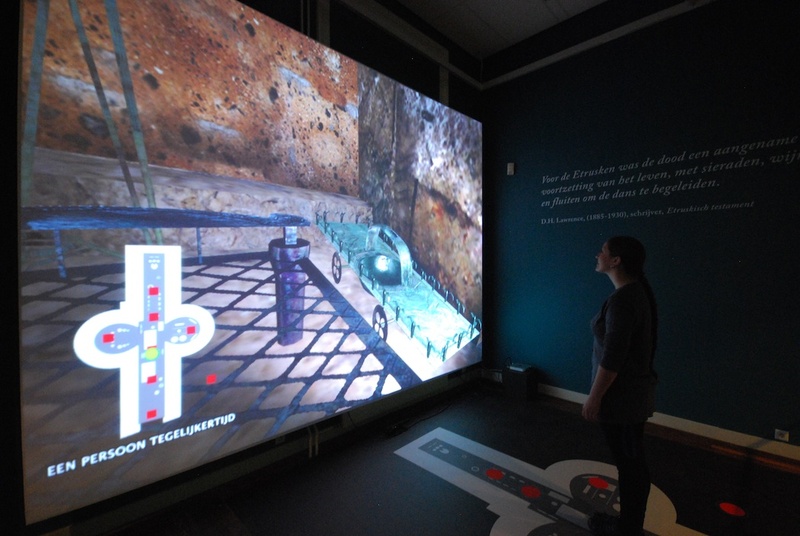 The interactive VR application, showing the reconstructed Regolini-Galassi tomb, has been installed in the Allard Pierson Museum (APM) in Amsterdam and the National Museum of Antiquities (RMO) in Leiden. 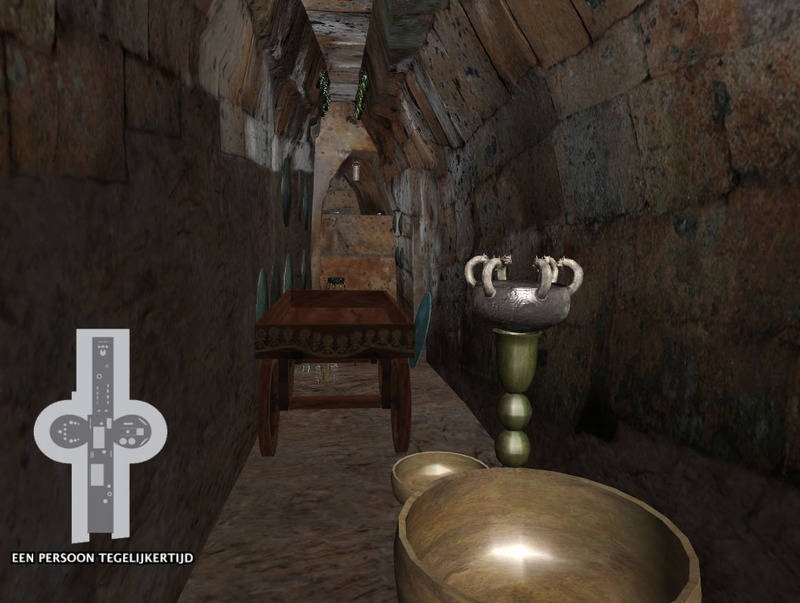 The most innovative element of the application is the use of a natural interaction interface, which means that the user moves inside the 3D space just by walking around on a map of the tomb. 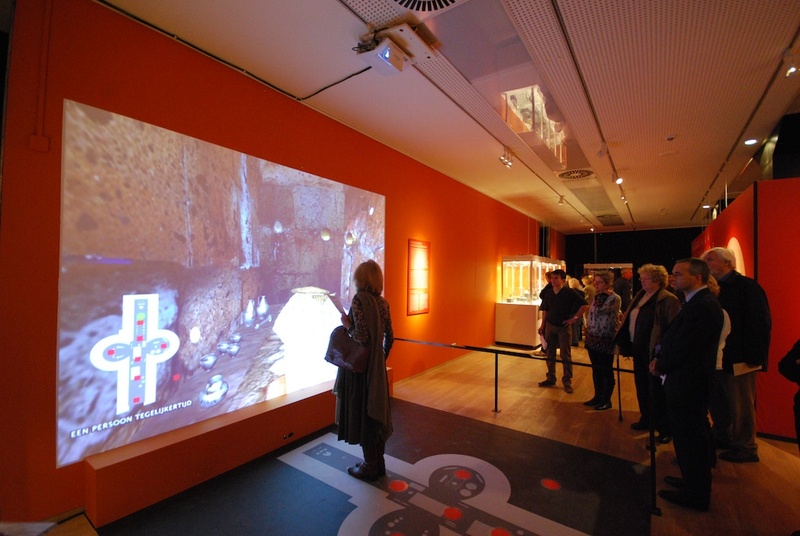 The public can explore the virtual tomb, see the digital artifacts in close-up, and listen to stories told by the prestigious Etruscan personages that were buried nearly 2700 years ago in the tomb. All this is possible by moving around in front of the projection, in a simple and natural way. The user walks on a map of the real grave, attached to the floor, on which some hotspots are indicated. 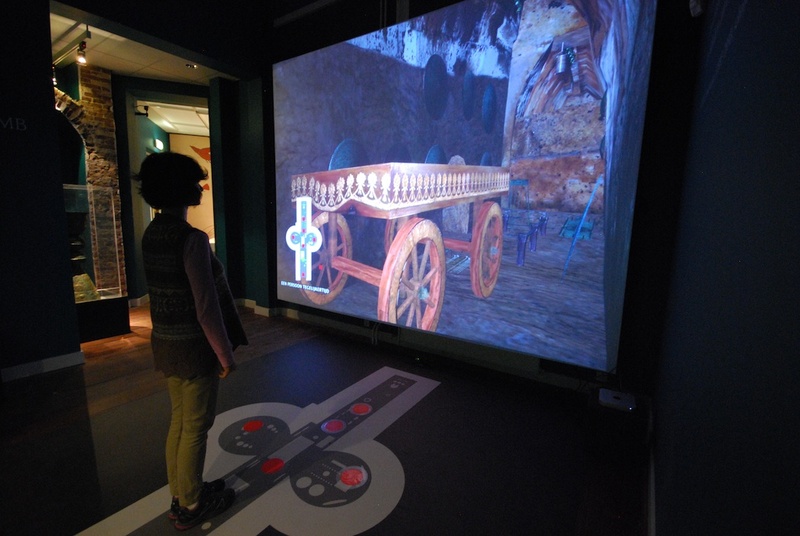 Changing position from one hotspot to another, one moves also in the virtual space, exploring the tomb and the objects and triggering the storytelling. This solution not only results in an amazing interaction for the public but allows also people of every age to enjoy the virtual content without any prior knowledge of 3D interaction. The story is told in the first person by the two people that are buried in the tomb. 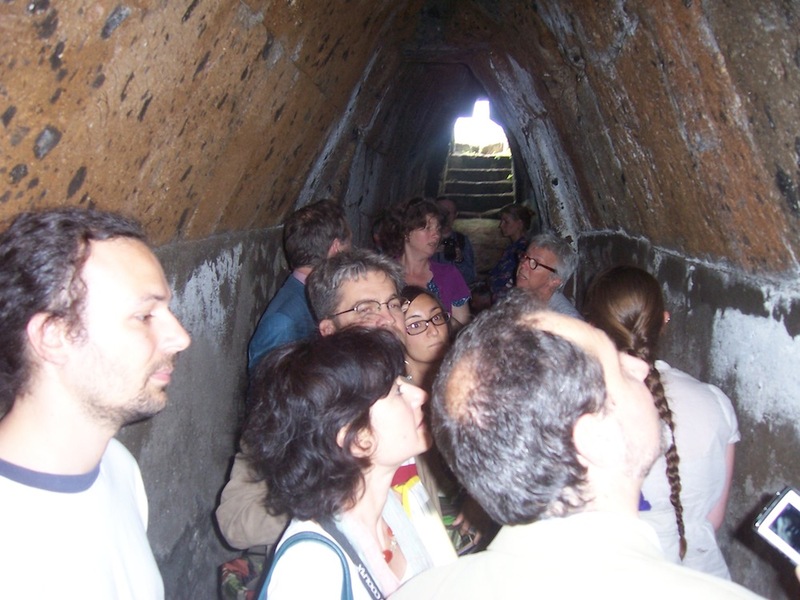 They are ghosts, living today and knowing our culture and society, but guiding us around in their tomb just after the burial, speaking from their point of view of Etruscan nobility. 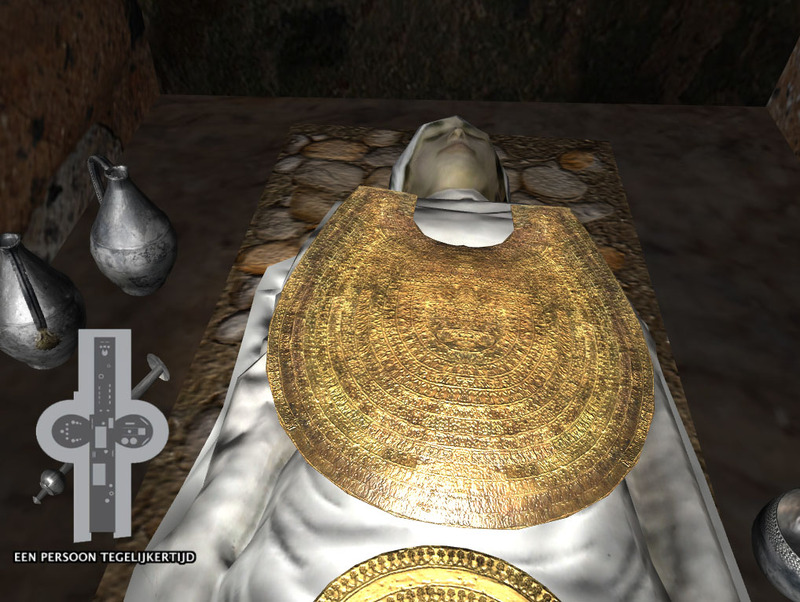 The stories are linked to the objects in the tomb, which are visualised in close-up, highlighted by extra virtual illumination. 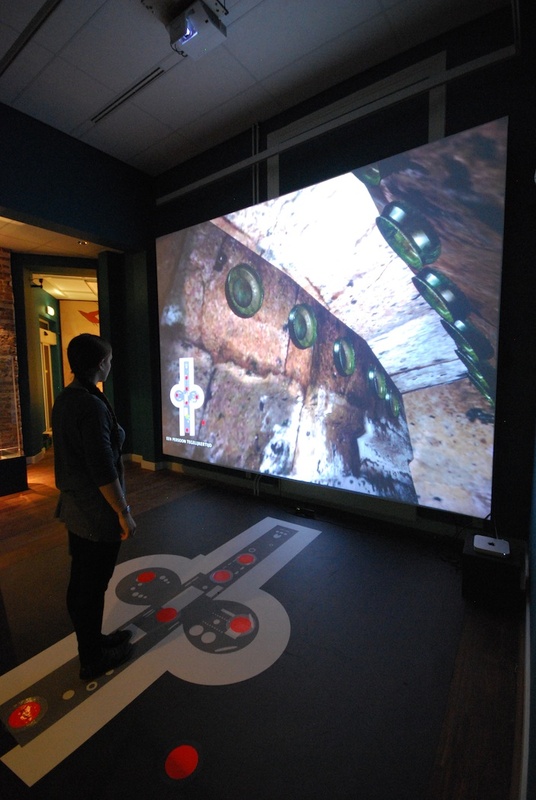 The image is projected on a large 12 sqm screen from above by a special projector with mirrors, so that the visitor never gets in the way of the projected image. Together with the physical involvement of the user, this produces a strong sensorial immersivity. 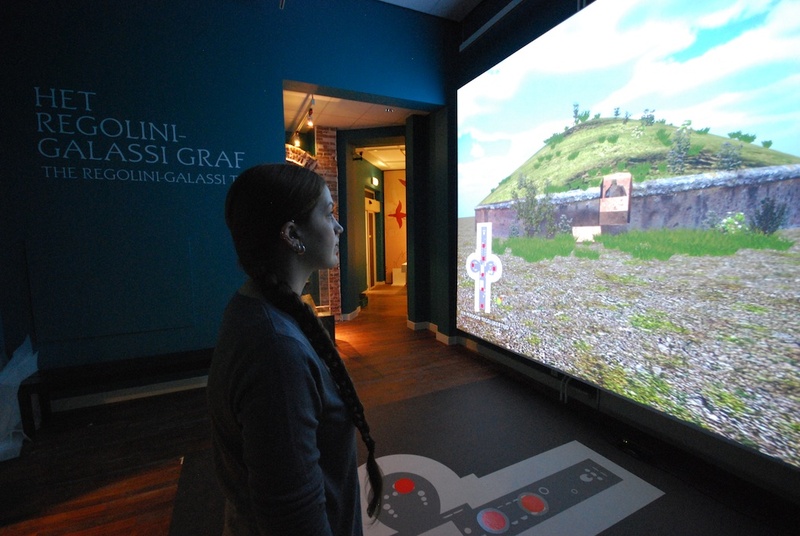 This VR installation in both museums is the first result of a two year multidisciplinary project Etruscanning that will be further developed by the Allard Pierson Museum, CNR-ITABC and Visual Dimension, in close cooperation with the National Museum for Antiquities of the Netherlands, the Gallo-Roman museum of Tongeren, the Vatican Museums, the Soprintendenza dell’Etruria Meridionale di Villa Giulia and CNR-ISCIMA. 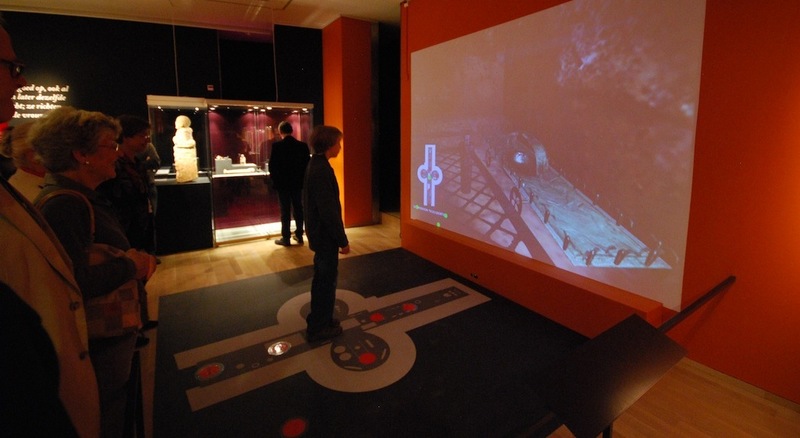 The interactive application, that will be inaugurated in the Allard Pierson museum in Amsterdam on October 13, 2011, and in the National Museum of Antiquities in Leiden on October 14, 2011, is working. 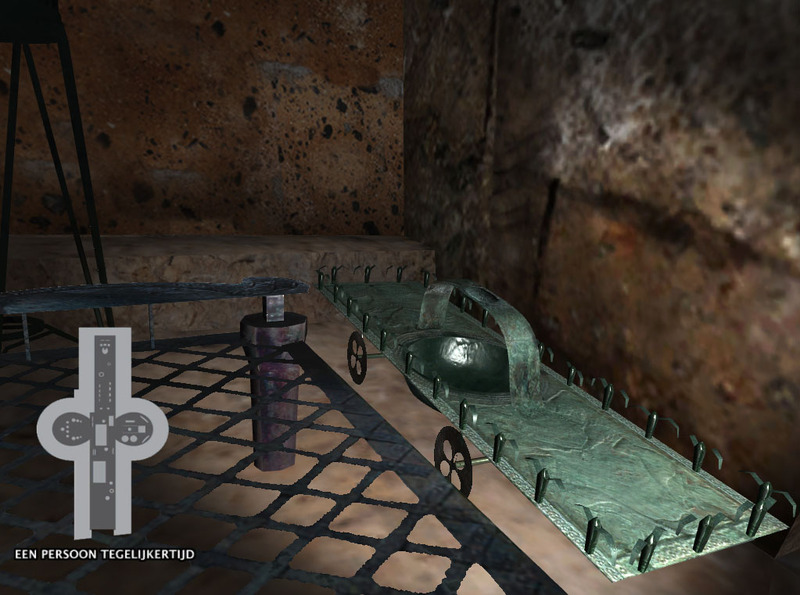 The application allows to interactively explore the Regolini-Galassi tomb by walking on a map of the tomb. In the next blog entry, we will explain in detail how the application works. This first version of the application shows already about 80 objects that were digitised in the last two months. More objects will be added in upcoming versions. For digitisaton, several techniques were used. The tomb was digitised by laser scanning. Most objects were hand modelled from new photography that was made by the photographic department of the Vatican Museums. 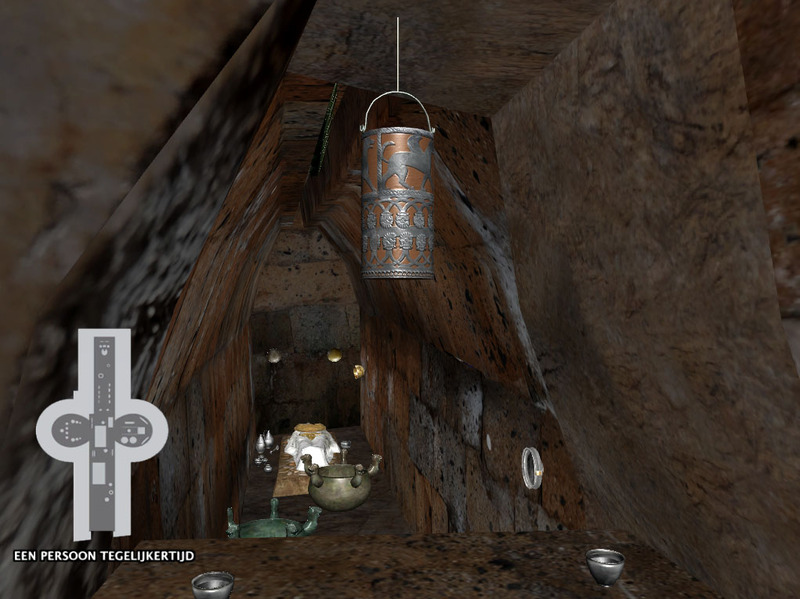 Some objects (such as the cauldron with griffin heads above) were modelled by automatic photogrammetry from images. 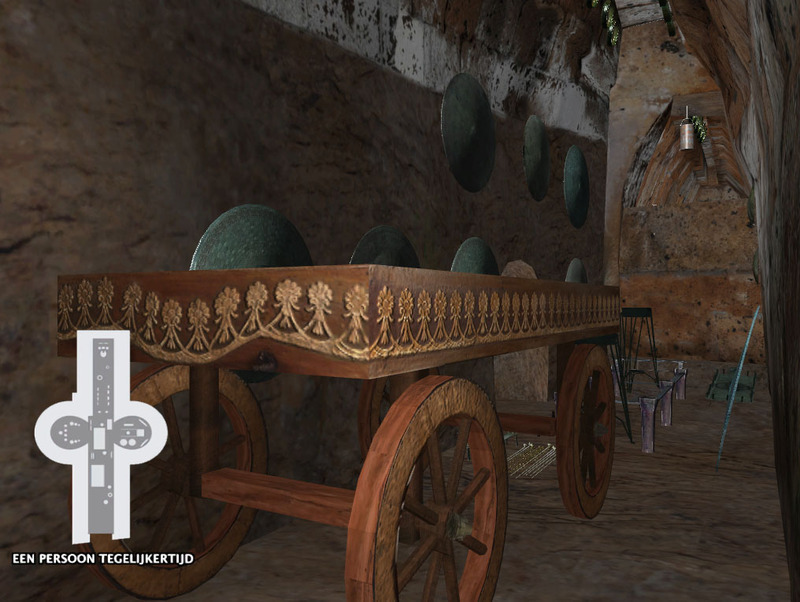 Other objects could rely on physical reconstructions such as the chariot below. 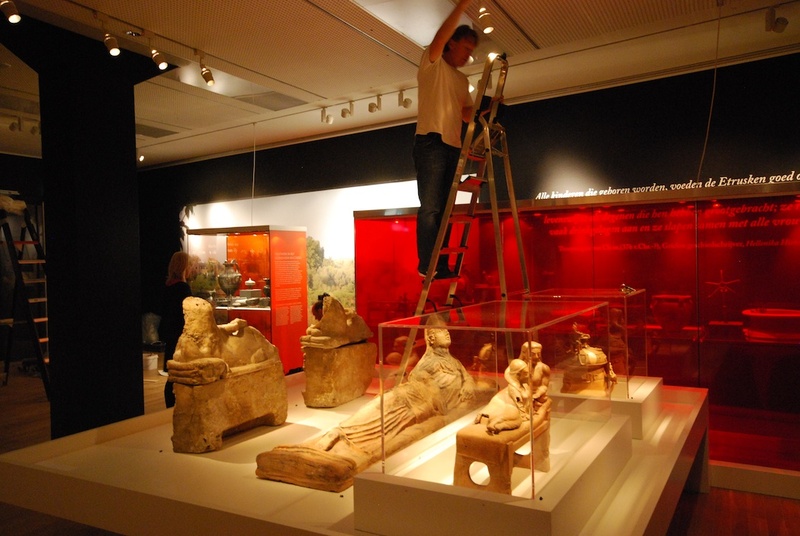 Many objects need more work, as most objects still need to go through a process of extensive digital restoration to bring them back in their original state at the moment of the burial. This includes removal of corrosion and repair of broken or damaged parts. 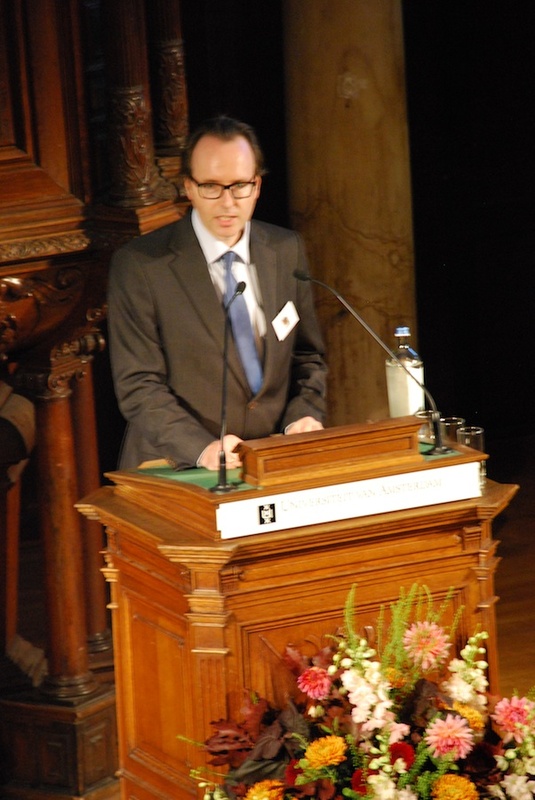 For others, the current reconstruction needs to be revised, based upon the most recent archaeological understanding about these objects (such as the chariot above). 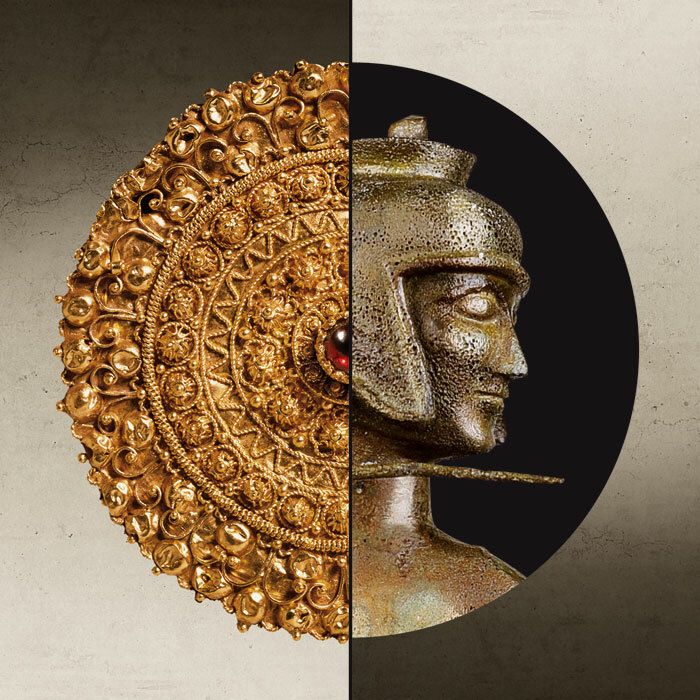 Some objects were the result of extensive digital restoration. The situla for example (see image below) was recreated digitally based upon the current physical restoration. This recreation was made by simulating the production processes of the object, such as engraving and embossing the sheet of silver that is wrapped around the wooden bucket. For the first time, a visualisation is shown of the woman, buried in the Regolini-Galassi tombe. 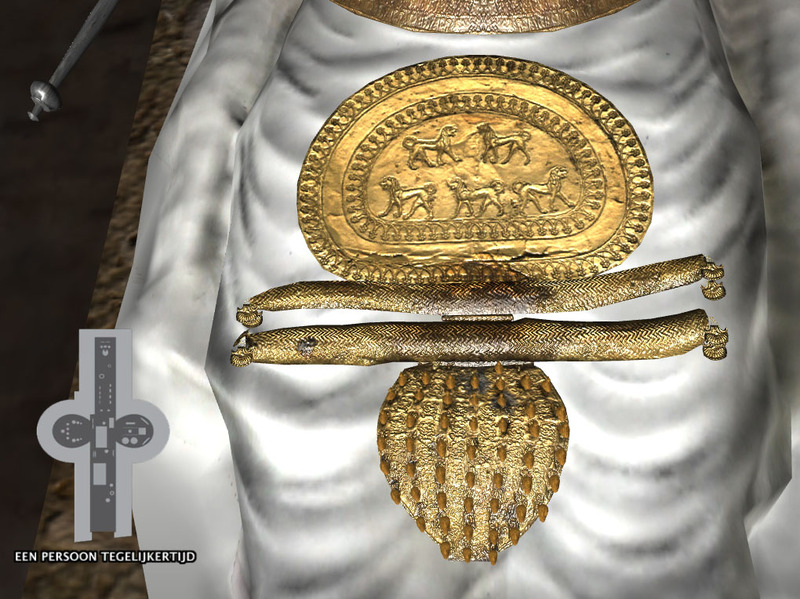 Currently, we have limited the visualisation of the objects to the golden pectoral and the golden disc fibula, but future work will add more jewels, and the fibulae and golden leave decoration on the shroud. A lot of new research was done to concerning the position of the golden disc fibula. As we could not prove from iconography that the shroud was used to cover the face, and as other research showed that such a fibula was rather placed on the abdomen, we stick in our visualisation to the second hypothesis we have proposed, in favour of placing the fibula on the face (see image below). A short movie, showing this first version of the VR application in action, can be found here. 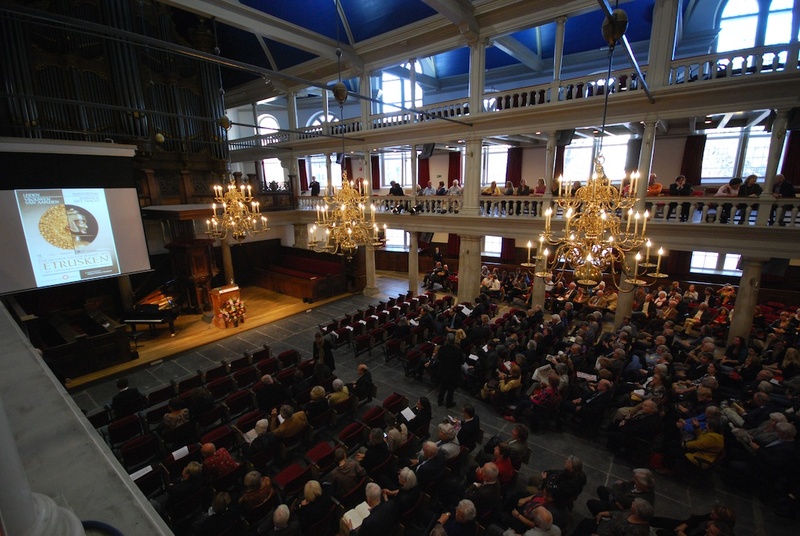 The Etruscanning partners will continue to improve the VR application in its current form and develop new ways of visualisation and interaction for the next exhibition in Tongeren, Belgium at the end of 2012. In the upcoming blogs, we will not only show the installation and the application in action, but also shown more details about the modelling and digital restoration of the objects, and about the storytelling paradigm of the VR application.